MANILA, Philippines - Have you been thinking of organizing your home but can’t imagine letting go of your much valued belongings? Are you considering moving to a smaller residence just to fit in all your possessions? Do you have things that are taking up too much space at home and work? Worry no more as SafeHouse Storage Philippines offers a secure, efficient and convenient experience for your packing, moving and storage needs. Organizing your environment and getting rid of those which are already not much of a use is important so you could leave spaces for the new ones. But throwing them out of your house is not always an easy task because some of them have a sentimental value, apart from the monetary value. Sending boxes to a storage facility presents a safe and secure solution to “keeping” items you’re not quite ready to part with yet. First introduced by enterprising brothers, Marc and Carlo Coronel in 2010, and inspired by the self-storage concept that continues to gain popularity in the United States, SafeHouse Storage is the first and largest self-storage facility in the Philippines with two fully functioning branches located in Taguig and Quezon City. Since its beginning, the number of units has grown by 3,000 percent. Each facility offers a range of storage unit sizes all having roll-up doors for each tenant’s privacy, 24/7 CCTV cameras, and roving security guards to provide safety and security. The smallest storage unit can accommodate at most eight balikbayan boxes, and the largest unit is capable of storing 110 balikbayan boxes. Rentals start for as low as P2,000 per month. Unlike the self-storage services available in other countries, SafeHouse Storage offers storage solutions that are personalized to meet customers’ needs, including end-to-end services that include packing and moving to ensure reliability and convenience. Aside from providing clients with regularly maintained and secure storage space, SafeHouse Storage’s team of experts can assist in packing and transporting even the most fragile items such as antique furniture, paintings and collectibles. Knowing that organizing and keeping track of valuables can be a tedious task, the team offers their services in records management and archiving. For added convenience, customers may opt for a customized racking and tracking system that allows them to retrieve and review documents with ease, or a barcode system that makes management of the files more expedient and accurate. 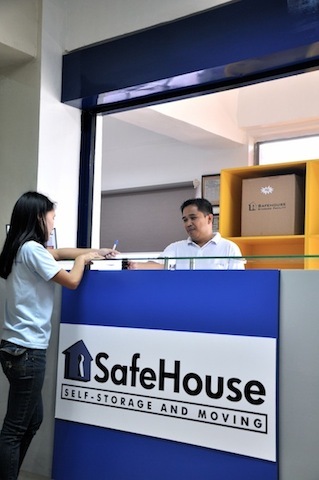 SafeHouse Storage also offers insurance with a starting coverage of P100,000. Even on-site auctions can be conducted with the Company’s accredited wholesale buyers for items that clients want to dispose. “We have designed our business to make it really work for our customers,” explains Marc Coronel. “We realize that the whole exercise of packing belongings and shipping them off to a storage facility is one that demands time and effort from already busy schedules so we’re making it easy for busy people to just hand off to us and we’ll take care of everything that needs to be done, down to making packing lists and managing their records at the facility. We’ve invested in training our people in the ‘science’ of packing and storage, and have invested in the technology and partners that make this happen,” he further explicates. With storage now becoming a necessity for more families and businesses, new facilities within Metro Manila and new services are in the pipeline to respond to growing demand. “We are working on expanding our record management services and looking at climate-controlled spaces to store items that are more sensitive to weather such as furniture, paintings, media tapes and material that businesses keep in stock with us,” shares Carlo Coronel. “We are very happy with the response to SafeHouse storage and continue to work hard to maintain the trust that our customers have in us and our service,” he adds. For more information on SafeHouse Storage, check out their official website or like their Facebook page.